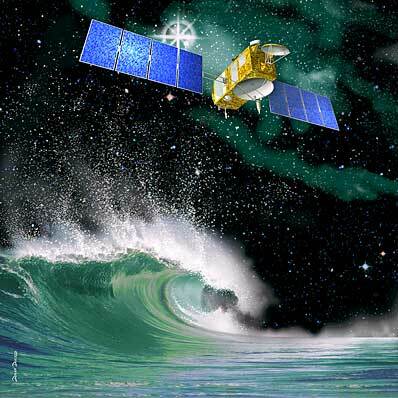 The Dec. 7 launch of Jason 1, NASA's newest oceanography satellite, will continue the mission started by Topex/Poseidon to monitor global climate interactions between the sea and the atmosphere. Jason 1 will monitor world ocean circulation, study interactions of the oceans and atmosphere, improve climate predictions and observe events like El Nino. Jason 1 is a joint U.S./French oceanography mission. "Jason 1 will be a tremendous asset to our oceanography program. It will take the research and development activities done so successfully on Topex/Poseidon and add operational utility and function," said Dr. Ghassem Asrar, associate administrator for NASA's Earth Science Enterprise, NASA Headquarters, Washington. Since the oceans are so large, remote sensing from satellites has proved to be the only way to get global information about these vast, hard-to-measure expanses. Spaceborne altimeters, such as the Poseidon 2 instrument that Jason 1 carries, can calculate ocean heights to within centimeters. Gary Kunstmann, Jason 1 project manager at NASA's Jet Propulsion Laboratory, Pasadena, Calif., said, "We're very excited about this launch and looking forward to greater knowledge of the 'whys' and 'hows' of the world's climate systems." Jason 1 is the follow-on to the very successful Topex/Poseidon satellite, a U.S.-French mission that has been making precise measurements of ocean-surface topography since 1992. The ocean and atmosphere transport heat from the equatorial regions toward the icy poles, and the atmosphere sends heat through a complex, worldwide pattern of winds. As these winds blow across the oceans, they help drive the currents and exchange heat, moisture and gases with the water. While winds create daily, short-term weather changes, the oceans have a slower, much longer-lasting effect on climate. The powerful forces of wind and water combine to help regulate the planet's climate. Accurate observations of sea-surface height and ocean winds provide scientists with information about the speed and direction of ocean currents and the heat stored in the ocean, which in turn reveals global climate variations. Jason 1 will help scientists in their quest to understand these global climate forces. Weighing about 500 kilograms (about 1,100 pounds), Jason 1 is only one-fifth the weight of Topex/Poseidon. After launch, Jason 1 will enter orbit about 10 to15 kilometers (6 to 9 miles) below Topex/Poseidon's 1,337-kilometer-altitude (830- mile) orbit. During the next few weeks, Jason 1 will use its thrusters to raise itself into the same orbital altitude as Topex/Poseidon, and then move in close behind its predecessor, trailing by about 500 kilometers (300 miles). The two spacecraft will fly in formation, making nearly simultaneous measurements. The science team will compare the data to make sure the instruments are calibrated exactly. This procedure is expected to take about six months. Jason 1 will then assume Topex/Poseidon's former flight path, and the older satellite will move into a parallel ground track midway between two Jason 1 ground tracks. Jason 1's mission is designed to last three years. Jason 1 carries five instruments: the Poseidon 2 altimeter, the spacecraft's main instrument, to measure altitude; a microwave radiometer to measure atmospheric water vapor; and three precision location-finding instruments. Jason 1 is a joint project between NASA and France's Centre National d'Etudes Spatiales. The U.S. portion of the mission is managed for NASA's Office of Earth Science, Washington, by the Jet Propulsion Laboratory, Pasadena, Calif.